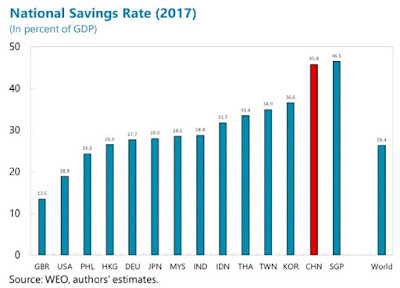 China has a remarkably high savings rate in a typical year--and sometimes it is higher than that. In fact, the main reason for China's high trade surpluses is that with such a high savings rate, China doesn't consume either a lot of imports or domestically produced goods. A reason that China can invest so much, year after year, is that the investment is financed by high savings rates. A standard recommendation for China's economy for at least the last 15 years or so is to "rebalance" toward being an economy driven by domestic consumption, not by investment. A team of economists from the IMF--Longmei Zhang, Ray Brooks, Ding Ding, Haiyan Ding, Hui He, Jing Lu, and Rui Mano--discuss these issues and others in "China’s High Savings: Drivers, Prospects, and Policies," written as IMF Working Paper WP/18/277 (December 11, 2018). Here's a comparison of national savings around the world in 2017. The US had national savings of 18.9% of GDP. The savings rate for the world as a whole was 26.4%. China was saving 45.8% of GDP, easily more than double the US level. And China's national savings rate is actually down a bit from when it peaked at 52% of GDP back in 2008. To get a sense of what these high rates of saving imply for the mixture of consumption and investment in an economy, consider this figure. The horizontal axis shows a country's level of consumption; the vertical axis shows its level of fixed capital investment. China is way in the upper left, with low consumption and high investment,. The authors write: "With GDP per capita in PPP terms being similar to Brazil’s, consumption per capita in China is only comparable to Nigeria. If Chinese households consumed comparably to Brazilian households, their consumption levels would be more than double." One sometimes hears saying applied to China: "Country rich, people poor." The high savings rate is why it can feel that way.